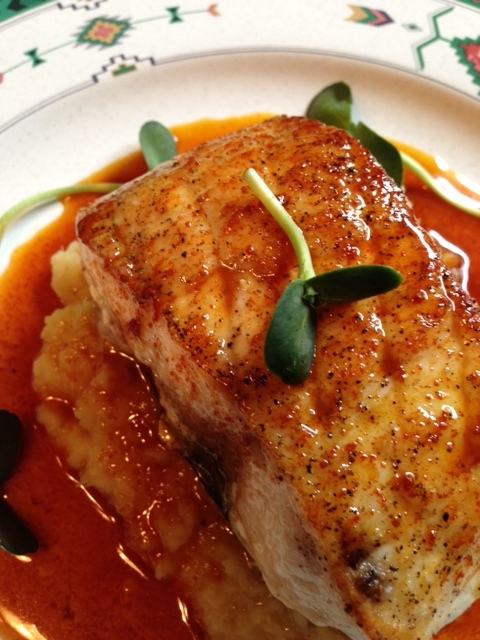 This dish could also be called Pan Roasted Sturgeon with Celery Root/Sweet Potato Puree and Carrot Gastrique, but on Awan it is a saluna, a sweet-and-sour fish, which comes in many forms depending on where in Awan the dish is prepared. In this saluna, the sweet-and-sour component comes from the gastrique, a sauce based on caramelized sugar deglazed with vinegar. This recipe is a little more complicated than the Uriah version I posted earlier this summer and is prepared with sturgeon, a controversial fish in Awan and among Jews. For a fish to be considered kosher, it needs to have both fins and scales. Sturgeons have fins, but do they have scales? Some sources say sturgeon don’t, instead they have scutes. Scutes are hardened and enlarged forms of a primitive type of scale called a ganiod scale, so other sources say they do have scales. However the scutes of sturgeon look very different from the scales of salmon, carp, or other kosher fish, and they are not easily removed without ripping the flesh of the fish. Therefore, Orthodox rabbis have declared that sturgeon are not kosher. Some other rabbis do consider sturgeon kosher, and therein lies the controversy. Fish without scales are also considered inappropriate to eat by some Awan tribes, especially the Uriah. The Dayag respect the Uriah because the kings of old came from Uriah, but they resent how arrogant the Uriah can get, especially when it comes to deciding the morality of food. Why would one fish be better than another, they ask. The Dayag value all fish, especially the ancient sturgeon that lives in both the sea and the rivers, so the Dayag eat sturgeon whenever they can. This recipe works well with sturgeon, halibut, or any other firm white fish. If you’d like to use a less controversial, and perhaps easier to find fish, feel free to substitute. When you buy your fish, ask the fish monger for a recommendation on how long to cook it since fish fillets can vary in thickness depending on the size of the fish. For this recipe, we used sunflower microgreens as a garnish, which added a delightful flavor. We purchased them at the Portland Farmers Market from a local supplier, Nightlight Farms. Feel free to substitute any type of microgreen or chopped chives. 1. Place a large pot of water over a high flame and bring up to a boil. Add 2-4 T salt to water. The water should taste a bit salty. 2. While the water is coming up, peel the sweet potato and the celery root. To peel a celery root, cut off the ends of the root, place it on a cutting board on one of the flat ends, and with a sharp knife cut down along the sides to remove the thick skin. Use a peeler to remove any remaining skin. Celery root flesh turns color quickly. You may want to rub it down with a little lemon juice at this point. 3. Cut the sweet potato and celery root into one inch pieces. Once the water is up to a boil, add the potato and celery root pieces to the water. 4. Start the sauce by combining the water and sugar in a small pot. Cook over a high heat until the water boils off and the sugar starts to caramelize (it just begins to turn brown). 5. While the sugar/water solution is boiling, check the sweet potatoes and celery root with a fork, when they are tender, turn off the heat and strain. 6. When the sugar is golden brown, turn off the heat and add the vinegar. (Be Careful! When the cold vinegar hits the boiling sugar, it will splatter and the sugar will “seize” into a solid). Turn the heat back up to high and whisk until the sugar has melted into the vinegar. Add the carrot juice and cook on high until it reduces in volume by about 3/4 (or a little more). 7. While the sauce is reducing, season the fish on both sides with salt and pepper. Heat a large frying pan and add 1-2 T of oil. Carefully add the fish flesh-side down, and cook over a medium heat for 2-3 minutes. 8. Turn the fish over and place the pan in the oven for approximately 10 minutes (for thin pieces of fish) to 15 minutes (for thicker pieces). It’s good idea to get a recommendation on cooking time from the fish monger. 10. Add butter and horseradish cream to celery root/sweet potato puree. Stir gently with a wooden spoon or rubber spatula. Taste and adjust seasoning with salt and pepper. Cover and keep warm over low heat. 11. Once sauce has reduced in volume by about 3/4, whisk in the butter. Turn the heat down to low and taste. Adjust seasoning with salt and pepper. Keep warm over low heat. 12. Check fish by inserting a two-tine fork through the side of a fillet. If it slides in easily, the fish is done. 13. Check the sauce. If it has started to separate, bring it back together by whisking in a little more butter. 14. To serve- spoon a generous portion of the celery root/sweet potato puree in the middle of a plate and flatten with a spoon. Place a piece of fish on top. Spoon sauce over the fish and allow it to run down onto the plate. Scatter microgreens or chopped chives on fish and around the plate. for the reason that i wish for enjoyment, since this this web site conations in fact good funny data too.